Amines are a versatile class of compounds used in organic synthesis. There are heterocyclic, aromatic, and specialty amines. The C1-C6 alkyl monoamines (RNH2, R2NH, R3N) discussed in this report include mainly methylamines (C1), ethylamines (C2), n- and isopropylamines (C3), n- and isobutylamines (C4), and cyclohexylamines (C6). Each individual C1C6 alkylamine has its own set of applications, with the largest applications including the manufacture of solvents, pesticides, feed additives, rubber processing chemicals, and water treatment chemicals. China is the largest single producer and consumer of C1-C6 alkylamines, accounting for about 60% of total world production and consumption in 2017. Over 76% of consumption is methylamines (mainly DMA for DMF production, to supply the large synthetic/artificial leather [polyurethane-based] market)—an application that is comparatively miniscule in countries outside of Asia. Consumption of DMF in electronics, mainly in the manufacture of printed circuit boards, is a large market in Asia, especially China, Taiwan, South Korea, and Japan. As a result, Asia accounted for 68% and 71% of world consumption of methylamines in 2013 and 2017, respectively. China is forecast to remain the largest market for C1C6 alkylamines in 2022. Chinese demand for chemicals in water treatment and surfactants is expected to experience rapid growth. The solvent market (mainly methylamine-based solvents) is the most important end-use market for C1-C6 alkylamines. Major solvents include dimethylformamide (DMF), dimethylacetamide (DMAc), and N-methylpyrrolidone (NMP). These solvents are used in the production of spandex, polyurethane elastomers, and polyimide films; as cleaners for electronics products; and in various other uses. The second-largest market is agrochemicals. Consumption of C1-C6 alkylamines in the pesticides market fluctuates annually, because demand for pesticides varies according to weather and planted acreage. The percentage of consumption for this sector is relatively high for monomethylamine, monoethylamine, and monoisopropylamine. The third-largest market for alkylamines is for feed and food additives, including choline chloride from trimethylamine and artificial sweeteners (cyclamates) made from cyclohexylamine. The top six companies control about half of the total global capacity for alkylamines in 2017. 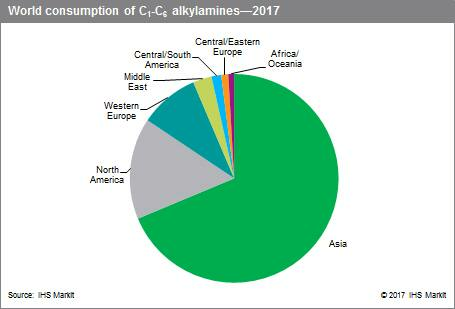 China accounts for nearly 60% of world production capacity for C1-C6 alkylamines, but the two largest world producers—Eastman and BASF—are based in the United States and Europe, respectively. Both companies operate plants in the United States, Germany, Belgium, and China. Eastman became the world’s largest producer with the acquisition of Taminco in December 2014. The remaining major producers operate solely in China. Consumption growth rates are expected to be relatively high in India and China (3–4% per year), but only about 2% in the United States and less than 1% in Western Europe and Japan. Overall, world consumption of C1-C6 alkylamines is expected to increase at about 2.5% per year during 2017–22.